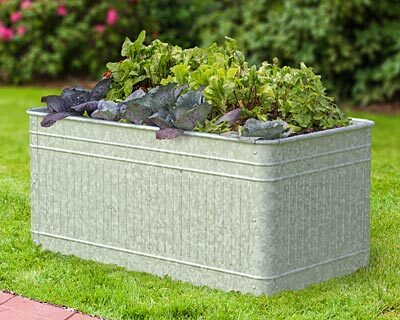 Bring a rustic hint to your landscaping or create a generous planting area for crops using this Panacea Aged Galvanized Vintage Raised Rectangular Planter. This generous, all steel unit creates plenty of planting area in your yard, while its shape evokes a classic livestock watering trough. Raised vertical and horizontal lines on each panel enhance the motif, while its mottled gray color offsets your plants. An included cross brace spans the 21" width of the piece, and its open frame can be lined with plastic or coco fibers (not included) to create a bed for your crops. Included hardware assists with assembling the unit, and its open base makes it easy to reposition each year. The all steel construction remains durable, and the aged hue offers a timeless hint. Add a charming planting spot to your patio or landscaping using this Aged Galvanized Vintage Raised Rectangular Planter. Assembly required.